Affected how I felt about my appearance and not being more active in sports at school. 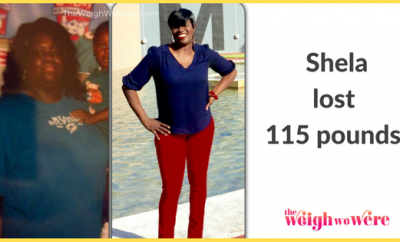 Lost weight before through Weight Watchers with some success in my 30s. I was in an abusive marriage and turned to food for comfort and had a couch potato existence. 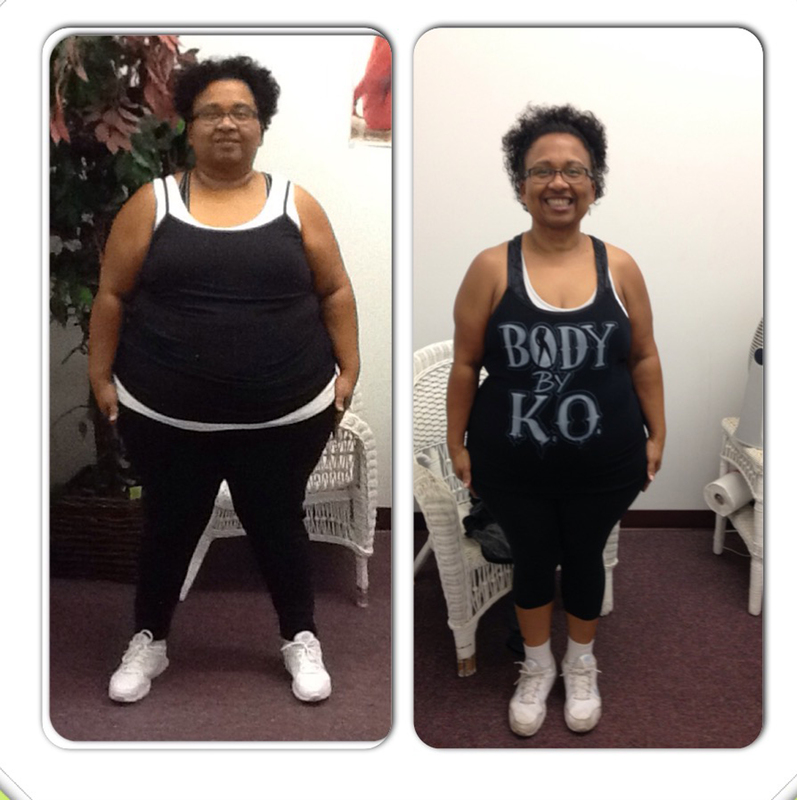 I developed hypertension, had PCOS – polycystic ovaries (which put me on medication for diabetes-glucophage) and I was on a diuretic for swelling.I finally left the marriage and through some soul searching decided to finally do something. I approached a trainer I had known for years who is a former Highland Games champion, Kerry “K.O.” Overfelt. He is a certified personal trainer and strength and conditioning coach with 22 years of weightlifting experience. He is the owner and operator of Darkside Athletics at Bourbon City Fitness. He also coached several high school, college and pro athletes. I am a journalist at my local newspaper and we had covered some of his events. I asked to meet with him to discuss a proposition. I told him about my situation and if he would like to help me through this journey and have it documented for the paper every month on our progress. He gave me a workout schedule with him and a low-carb nutrition program he invented. 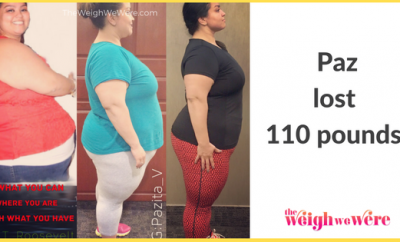 Within the first month I had lost 10 pounds and six inches in my arms, bust, waist and hips and thighs combined. mostly just afraid of the entire process, i.e. will I be able to do it, will it hurt, will it work and will I be hungry. I never wanted to give up. First of all failure was not an option. My editor told me in no uncertain terms that if I failed I was going to have to document that as well. And I was not about to put myself out there and not go through with it. My motivation to keep going came from family, friends and co workers and my reading public, who I called my Gladiators (referring to the followers of Kerry Washington’s character Olivia in the sitcom Scandal). I live in a very small town where I was recognized all the time. So I was constantly approached by people I didn’t even know who praised me for my efforts and were proud of me putting it all out there. And last but not least was my trainer, he is my biggest fan and one of the best friends anyone can have. Along with being a personal trainer, he ran a gym called Darkside Athletics, where young and old, lawyers, doctors, young professionals, students and more exercise together in strength training and weight conditioning. After a few months alone with him, he encouraged me to attend the class, which was quite intimidating, but it was the catalyst of my success. Along with him and all my classmates, they motivated me to go beyond what I never thought I was capable of and I’m still moving forward to being stronger and healthier. I did hit a couple of plateaus. Around 20 pound loss and 50 pound loss marks. K.O.’s method was changing or tweaking my nutrition and a microfast with a BCAA drink. That way I would kind of get a jumpstart to the next phase of my training. 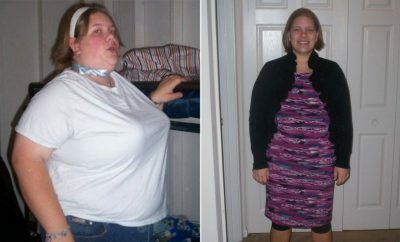 Actually once I started losing weight, it averaged about 5-8 pounds a month until recently with about half of that. I take a multi-vitamin, a fiber supplement and drink lots of water and that keeps me going. Oh yes.My first victory after a couple of months in training happened when K.O. was out of town and left me instructions to climb the stair mill for 20 minutes without getting off. I usually would be on it for no more than 5 minutes and I was terrified. Once I started climbing and reached the halfway mark I was ecstatic and I texted him that I did it. He was a proud papa! I probably eat a little more now than I did before but it consists of several small meals with low carb snacks like almonds and greek yogurt. I typically drink a protein shake following my workout at 6 a.m. six days a week, then a healthy breakfast about mid morning. Before I would grab muffins or breakfast sandwiches and be hungry before lunch. I do work a part time job in the evenings and weekends so I always have to have small meals to get me through the day. Luckily I work in a retail store adjoined with a restaurant which serves a variety of healthy items. Oh, please there is no comparison. I am a machine now compared to what I was. I hadn’t moved off the couch in years. I was in pain just walking around a mall or going up a flight of stairs. Now, I train for six days a week for 25-30 minutes. I recently added some additional cardio following my morning workout. A few of my classmates and I do power sprints on the treadmill for about 10-15 minutes. The treadmill is off and you sprint for 30 seconds, rest a minute. I also joined a mobility class from one of the trainers at the gym who is a physical therapist. I did experience some lower back pain which affected by flexibility and this 20 minute session really helped with that. I also had my first full body massage which really helped get the kinks out. If possible get a personal trainer, at least to get you started. Get one that’s going to be strict with the workout but make it enjoyable. If you can’t get a trainer then join a gym that offers weight conditioning and strength training classes. It will make you lean and strong. Find a good nutrition program. Hopefully your trainer or your gym should have that readily available. You should have a one-stop shop to good health when being part of a gym family. You should feel comfortable and welcomed while you are there. Stay focused and get a good support system around you. There are going to be some haters so be ready. Remember there is no quick fix. Take it slow and steady. And never ever give up. Kerry Overfelt- this is your client right?! 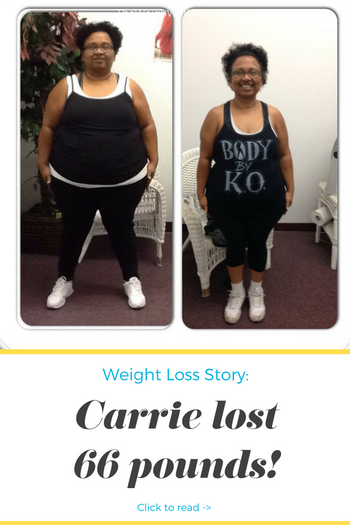 Thanks Carrie & The Weigh We Were.com !! I need to loose about 50+ pounds but not 100 & I have reached a bit of a wall. So many things in life to take care of …weight can be a subconscious thing to sabotage yourself….I’ve lost 30 pounds 3x in my twenties …eating less then I switched to excercise at gym with friend & lost 50…each time was to get a new bf after breakup….now i just want it for me & my health! But it can be hard . Congrats!! Love these success stories!! Good for her! She looks fantastic! Omg I have to follow her blog — how ? I want & need to loose weight too !! !